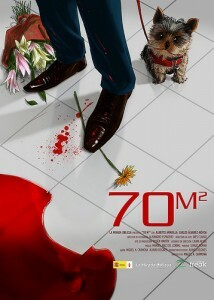 Shortfilm ’70m2′. Directed by Miguel A. Carmona ; Starring Alberto Amarilla and Carlos Álvarez-Nóvoa. Music by Manuel Ruiz del Corral. Ivan, exultant, goes to visit his girlfriend to propose her, but several unfortunate coincidences will make him to enter on a loop of catastrophic events that seems to be endless. •HONORABLE MENTION. 15th LOS ANGELES LATINO INTERNATIONAL FILM FESTIVAL (USA). •MEJOR CORTOMETRAJE DE FICCIÓN. MALAGA CINEMA 2011. •PREMIO DEL PÚBLICO AL MEJOR CORTOMETRAJE. XI SEMANA DE CINE IBEROAMERICANO DE VILLAVERDE. •PREMIO DEL JURADO JOVEN AL MEJOR CORTOMETRAJE. XXI FANCINE. •PREMIO RTVA A LA CREACIÓN AUDIOVISUAL ANDALUZA. V FESTIVAL “HIGUERA EN CORTO”. •PREMIO DEL JURADO AL MEJOR CORTOMETRAJE. I FESTIVAL DE CINE FANTÁSTICO DE TORREMOLINOS. •MEJOR CORTOMETRAJE. XII CERTAMEN “FERNANDO QUIÑONES”. •BEST DIRECTOR. 10th ANGRY FILM FESTIVAL. AUSTRALIA. •BEST SCREENPLAY. 10th ANGRY FILM FESTIVAL. AUSTRALIA. •SEGUNDO PREMIO. X CERTAMEN DE COTOMETRAJES “EL PECADO”. •SPECIAL DIPLOMA. NEW VISION INTERNATIONAL FILM FESTIVAL. REPÚBLICA CHECA. •PREMIO DEL PÚBLICO. I FESTIVAL DE CORTOMETRAJES ISAAC ALBÉNIZ. MÁLAGA. •MEJOR ACTOR. V FESTIVAL “HIGUERA EN CORTO”. •SEGUNDO PREMIO. II FESTIVAL DE CORTOMETRAJES LUMIÉRE. COLOMBIA. •PREMIO DEL PÚBLICO. II FESTIVAL DE CORTOMETRAJES LUMIÉRE. COLOMBIA. •MEJOR ACTOR. XV MUESTRA DE CINEMA JOVE DE ELCHE. •MEJOR ACTOR. III FESTIVAL PILAS EN CORTO. SEVILLA. •BEST ACTOR. 10th ANGRY FILM FESTIVAL. AUSTRALIA. •CARACOL DE LA TIERRA. IX CERTAMEN DE CORTOMETRAJES “POR CARACOLES”.